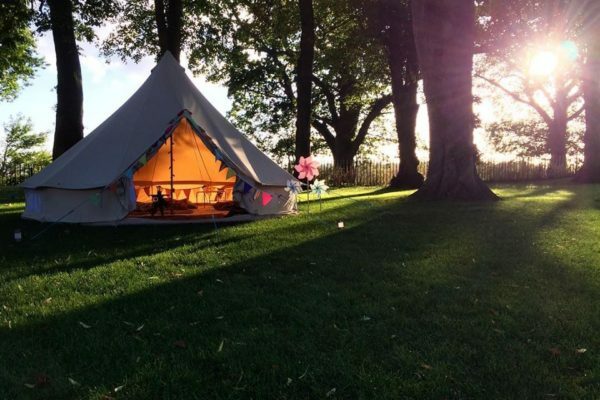 If you’re thinking of throwing a frolic, party or the ultimate wedding celebration and, glamping has snuck it’s way onto your ‘must have’ list, then choosing bell tents from ‘Our Bells’ packages is a sure fire way to appease even the most discerning camper. These bells offer varying choices for all glamper wants and needs and, if planning a Wedding Guest Village then utilising our brand new Unique Booking Page, can alleviate (nearly) all of the stress! Simply get in touch via our contact us page with your initial enquiry and we’ll go from there! We pride ourselves on being flexible and bendy to ensure any planning process doesn’t tie you up in knots. So please, don’t hesitate to get in touch with whatever your tenting ideas might be. 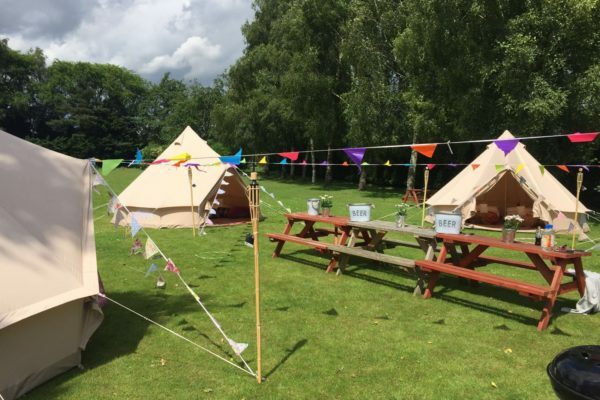 Ranging from 4m and 5m to the largest of the clan; the Emperor Bell (standing at 6m x 4m), you will find all our bell tents are available to hire either as BARE BELLS, SIMPLE BELLS AND BEDS or in COMPLETE SNOOZING BELLS packages. You will find all our bells have a hint of Indian inspiration, adding gorgeous rich colours, fabrics and design to their natural canvas. Ever increasingly our customers find that offering their guests a quiet den away from all the gaiety proves to be an invaluable addition to their celebration. Whether you’re seeking an opulent RAJAH LOUNGE for adults to really relax, a child friendly CHILL OUT TENT or a lady friendly PAMPER PARLOUR for pre party powdering, we’re sure one of our party bell offerings will certainly fit the bill. If you have tenting ideas which aren’t listed on our packages page, then please don’t hesitate to ask us – we’re always excited to think up and work with new ideas as to how our bells can play a part at any celebration.